The month of Ashada (according to the Indian lunar calendar) is synonymous with strong breeze and light winds! Puttaparthi is being rocked and swayed by the wind God and it is such a pleasurable experience at the end of a torrid summer. The kind Lord seems to be blowing the rain bearing clouds too towards the hamlet of peace and the sweet earthy scent pervades the atmosphere. 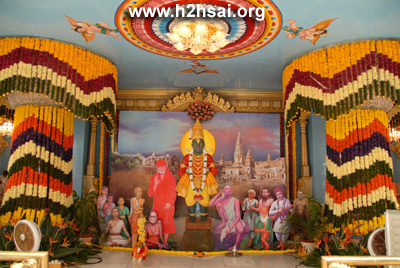 A wonderful statue of Panduranga Vitthala adorned the main stage and cutouts of a group of saints and holy men from the state of Maharashtra through the ages were also placed beside the Lord’s idol. In the evening, it was 5:15 p.m. when Swami arrived for darshan - the breeze blowing His fluffy hair and Swami sweetly adjusting it! As He moved through the ladies side, a mother carried her baby to Him and Swami lovingly blessed both of them. He seemed to massage the head of the baby and the mother was ecstatic! 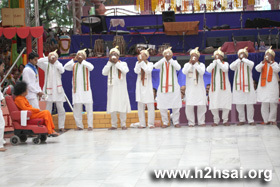 Swami was welcomed to the centre by devotees in traditional Maharashtrian attire blowing conches. He moved to the gents’ side and thrilled all the devotees gathered there with His darshan. 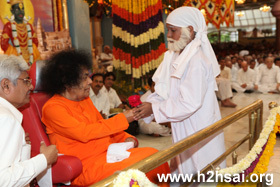 Arriving at the stage, Swami accepted roses from many of the devotees in the portico and side stage and blessed them. 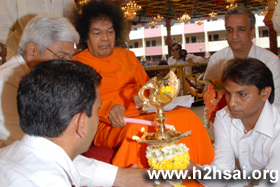 Swami then lit the lamp to mark the Ashadi Ekadasi. 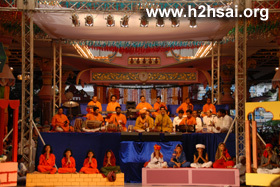 It was past 5:30 p.m., when Swami asked for the programme to begin. As has become the practice in the last several months, there was a line of offerings before the presentation could begin. Interestingly, in this line was also a wonderful portrait of Swami that had been painted with great skill and Love. 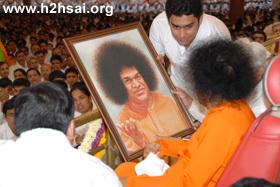 Swami looked at the painting closely and it appeared as though He was looking into a mirror! Also, the musical artists who would be providing the background score and singing all the songs, were 'introduced" to Swami one by one. Swami blessed them all and they took namaskar. A tiny ‘Shirdi Baba’ also offered a rose. Mr. Shivaraj Patil offered the Tulasimala (garland of tulsi leaves) to Swami and the sweet Lord plucked one leaf from it and put it in His mouth! After the artists and organisers offered their obeisance to Bhagavan, the programme started with the collective chanting of Pandurangashtakam. 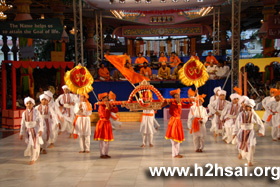 As the song “Jai Jai Vitthala Jai Hari Vitthala …” (Victory to Vitthala) was sung to the accompaniment of sweet music, two youth blew bugles to signal the formal commencement of the programme. At the outset, Dindi procession group members or Varkaris offered their humble salutations to Bhagavan through the song, “Maze Mahe Pandhari …” (my native place is Pandhari). The Varkaris are pilgrims who walk all the way to Pandharpur in Maharashtra to be there on the day of Ashadi Ekadasi and offer their salutations to Lord Vitthala. Following that tradition, many Sai devotees walk from Dharmavaram to Puttaparthi. 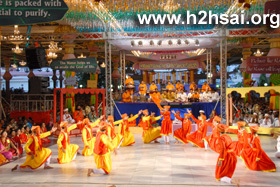 The members of that dindi procession came forward and offered their pranaams to Swami. A garland of Tulsi leaves was offered at His feet. 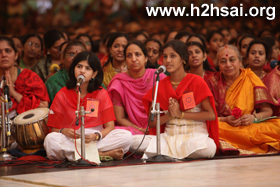 The programme was entitled, "Maharashtra Bhakti Gaatha" and it consisted mainly of songs and dances. It depicted through the songs of various saints of Maharashtra, the power of the Lord's name and the ephemeral nature of all material possessions. It attempted to convey that the only way to peace and happiness is simplicity in life. 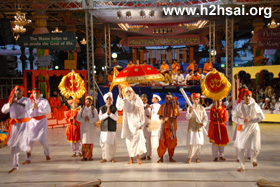 A procession of saints with dances followed during which the three people involved in a conversation in the presentation said that Maharashtra was blessed with the touch of Swami's divine feet as well. 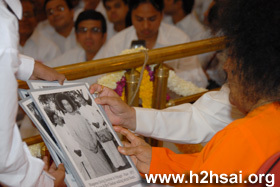 A little boy asked Swami, "Swami, would you like to have a look of the photographs of your visit then?" 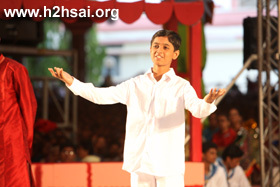 Swami nodded a sweet yes and the boy moved on the stage and showed the black and white photographs to Swami. Then, the depiction of famous Chavadi Procession of Shirdi Baba with the accompaniment of the Bhajan “Dam Dam Dam Damaru Bhaje” evoked nostalgic memories of those glorious days of the previous incarnation. All the songs were being sung live from the huge stage that had been erected in the background. Again, the same child who had shown the photos asked Swami, "Swami, is it true that Swami would again visit Dharmakshetra?” In reply, Swami called the child to the stage and in an instant materialised a gold chain for him. 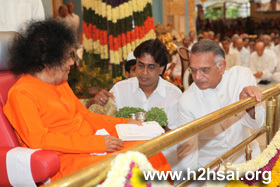 Patting him on his cheeks, Swami asked for the aarthi to begin. 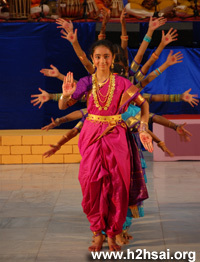 And so, at 6:50 p.m., eighty percent through the programme, prasadam was distributed and aarthi was performed. For those who had kept the fast, it was a wonderful to end it with the darshan of the Lord and the prasadam He blessed!